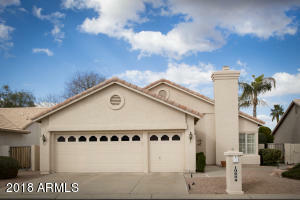 Enjoy active adult retirement living in this gated Sun Lakes AZ community of Ironwood Country Club. This home features 2 bedrooms, 2 baths and a formal dining/living room w/fireplace. A spacious kitchen with lots of storage is open to the family room with views of the private back yard. Master Suite has an exit to the patio, walk in closet, separate shower and tub and dual sinks. Murphy bed conveys in the guest bedroom. Multi Zone HVAC was replaced in 2008 and water heater replaced in 2016. 2.5 car garage with attached storage cabinets. You will love this quiet and intimate community of 734 homes with access to resort amenities including golf, tennis, pickle ball, fitness center, clubhouse, bar and restaurant, walking paths and many activities. Close to all airports and shopping.